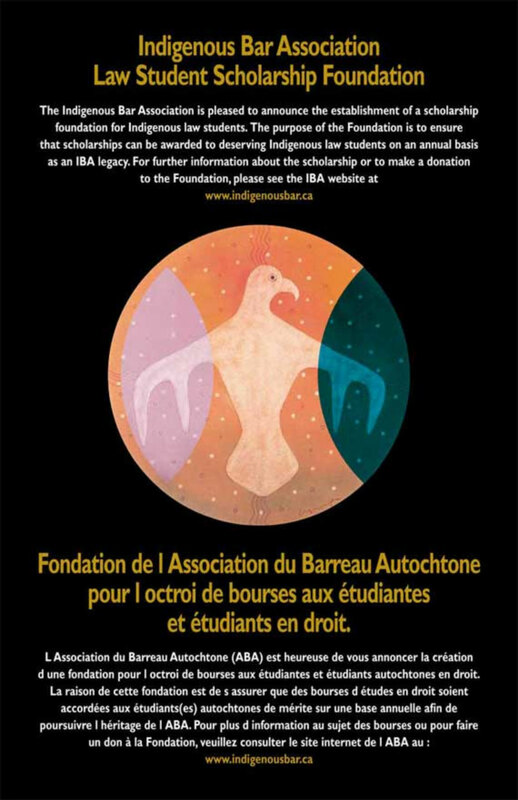 The Indigenous Bar Association invites you to support a scholarship foundation for Indigenous law students. The IBA Law Student Scholarship Foundation was established in July, 2003 as an independent charitable non-profit corporation. The purpose of the Foundation is to promote the advancement of Indigenous legal education by providing scholarships to Indigenous students attending post-secondary law programs. The scholarships are awarded to successful student candidates who are in need of financial assistance, who have achieved well academically and have contributed to their communities. We are actively seeking financial contributions to the foundation from individuals, corporations or other bodies to assist us in achieving our objectives. Official tax receipts will be issued to those who contribute. To promote the advancement of education by providing scholarships to Aboriginal students attending post-secondary law programs. To solicit and receive donations as a charitable organization to establish and expand our abilities to award grants and scholarships to further the academic aspirations of Aboriginal students to pursue a legal career. To do such other things as are necessary to further the above mentioned objectives.